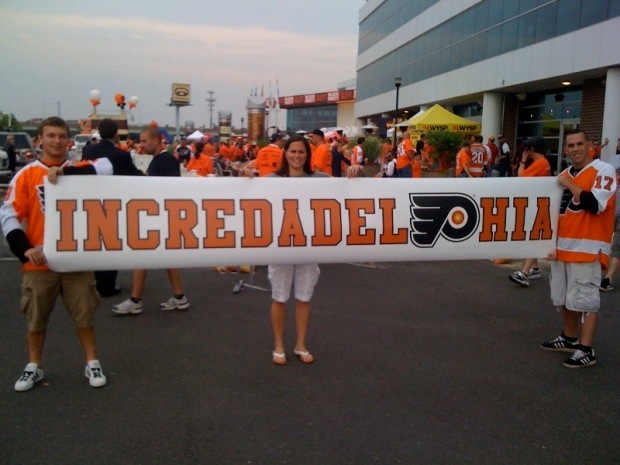 The Flyers run to the Stanley Cup Final has encouraged plenty of things from impromptu "Let’s Go Flyers" chants to playoff beards but there is one type of thing that is all the rage. We’re not just talking about the run-of-the-mill Eastern Conference tees you can get in almost any stores but we are talking about the creative ones that it seems only people in the know rock on their backs. Websites like PhillyPhaithful.com and Philavania have some of the most unique looks in Orange and Black. And we talked to the men behind the designs. Dan Hershberg’s Philly Phaithful has been pumping out great shirts for a while now but they certainly scored with a couple Flyers-inspired shirts including the owed to Michael Leighton Leight Show, Chris Pronger-inspired Rocked-a-Fellaand Dan Carcillo-enthused Danny Warhol. Some shirts like the Pronger and Carcillo tees were thought up during the season but Leighton’s string of playoff shut outs inspired Leight Show. But player centric shirts aren’t the specialty of Philavania -- known for their PhilliesIll shirts. “As for inspiration... our main rule is to make shirts that we'd like to wear ourselves,” said founder Charles Peacock. Things have taken off for Peacock’s company as more than 15,000 Facebook users now like Philavania. How nuts? Philavania now has more than 15,000 Facebook fans. But even if these guys have ideas for Stanley Cup champion shirts they sure aren’t letting know unless the Flyers win the Cup. “As a superstitious hockey fan who grows some form of playoff facial hair every season, I would be tempting the hockey gods by talking about a Cup Champs shirt,” Hershberg said. “I've got a pile of ideas on my desk about two feet high,” said Peacock. Now lets hope the Flyers take home Games 6 and 7 so that some of those ideas can come to light. Fan, follow and download: Keep up with the Flyers right on your phone! Text FLY to 639710 for updates on the Flyers' quest for the Cup. (Message and data rates may apply.) Get the latest from NBCPhiladelphia.com anytime, anywhere. Follow us on Twitter, Facebook and NBC Philadelphia. And, Sign up for our sports newsletter.